Differentials have a long history which many say go all the way back to the 1st millennium BC and recorded by China. While they didn’t have cars back then, chariots, wagons, and carts still experienced the problem of wheels slipping and dragging when cornering which damaged wheels, axles, and roads. The avoid this, a simple differential was invented. 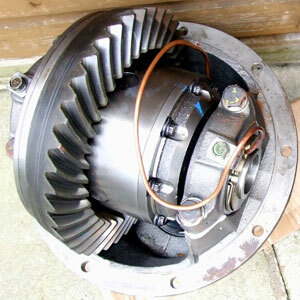 Today, there are four main types of differentials used in vehicles. Here they are with a quick summary of what each type is. This type of diff is the most basic and only allows for variations of individual wheel speed or slip but that’s it. 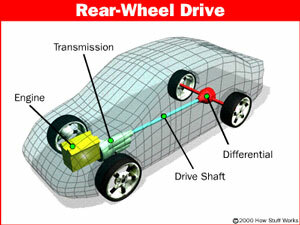 In optimal road conditions, it allows the outside wheel to rotate faster than the inside wheel. The problem is when road conditions are not ideal such as on wet pavement, ice, snow, or gravel. With an open diff, the engine torque still transfers even if the wheel has zero traction so that slipping tire will simply spin and not go anywhere. Open differentials are found in most vehicles on the road today so generally speaking, the cost to repair the differential is less that other diff types (if same axle). Under ideal road conditions, a limited-slip diff acts just like an open diff and transfers torque independently to each wheel. But, under hard cornering or heavy acceleration where an open diff would generally cause a tire to slip, a limited-slip diff prevents the normal amount of torque to go to the slipping tire (the one with least resistance). It does so through the use of clutches and plates within the differential. This enables the vehicle to power through corners a vehicle with an open diff would struggle with. Race cars and other performance vehicles (as well as some off-road vehicles) use limited-slip differentials. Found on many off-road vehicles and some performance cars, locking differentials use clutches and springs to activate a lock which sends an equal amount of power to each wheel no matter the traction situation. This essentially creates a fixed axle. The benefit is the locked diff’s ability to gain a greater amount of traction since the full amount of torque is always available to a wheel and not limited by the lower traction of one wheel. At higher speeds this is a negative but when off-roading or rock climbing, it’s a big advantage. The most complicated and advanced type of differential, a torque-vectoring diff uses a collection of sensors and electronics to obtain data from various things (road surface, throttle position, steering system, etc.) to activate electronically actuated clutches and a controller. Also known as active differentials, they work in the most efficient way which results in a truly dynamic, high performance driving experience. Torque-vectoring differentials can be found in some high performance rear-wheel drive and all-wheel drive vehicles. 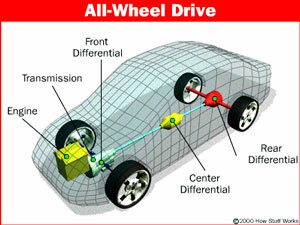 All vehicles have either a front differential or rear differential as part of the axle assembly. 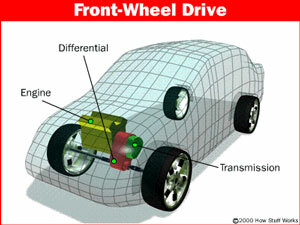 A front-wheel drive car will have a front differential while a rear-wheel drive car has a rear differential. If the vehicle has 4-wheel drive then it could have both front and rear differentials. 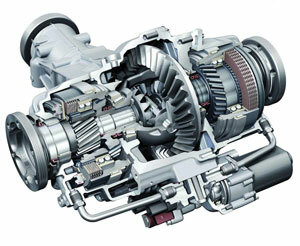 A differential can be defined as a gearbox that has 3 common elements: Side Gear, Ring Gear and Pinion Gear. It’s job is to drive a pair of wheels on an axle but allowing them to rotate at different speeds. This is necessary when your car is turning on the road. As you go around a turn, the outside wheel needs to cover a longer distance than the inside wheel so the outside wheel needs to spin faster. The differential allows this to happen. Based on information above, the Front Engine / Front-Wheel Drive setup uses a front differential that’s built-in together with the transmission/transaxle. This means that the cost to repair this setup is often more expensive than others. 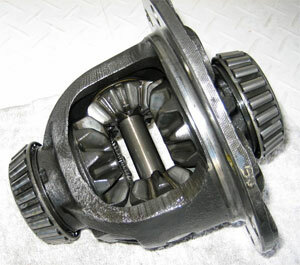 To repair the differential, the transaxle must also be pulled down and dismantled.